This is the “DOUBLE DEVIL” Twin AR (and yes, the caps are necessary). You may be wondering: “Why a monolithic billet twin side-by-side upper receiver?” Well, in all honestly, the reason is pretty much because they could. 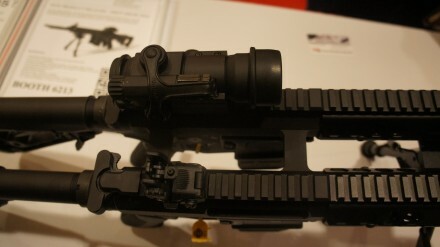 As previously mentioned, the DOUBLE DEVIL consists of dual monolithic billet heavy wall twin upper receivers. The receivers feature 16″ chromoly barrels, with a 1:9 twist, free-floated modular handguards, and flat top Picatinny rails. The DOUBLE DEVIL is compatible with any standard AR-pattern lower receiver, of which two are needed, and fire completely independently of each other. 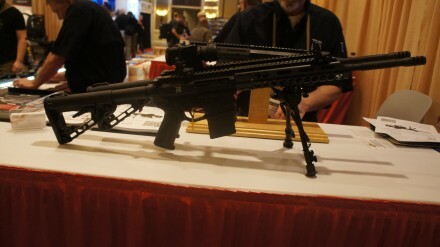 It also comes with a billet bi-pod mount, and is pivot / traverse capable. This entry was posted on Wednesday, January 20th, 2016 at 15:00	and is filed under SHOT Show, Weapons. You can follow any responses to this entry through the RSS 2.0 feed. Both comments and pings are currently closed.